Boo at the Zoo Ticket Sales On Sale NOW!!! Bring your little ghosts and goblins to Audubon Zoo this year for Boo at the Zoo! Held in conjunction with Children's Hospital, this annual Zoo extravaganza features trick-or-treating, a haunted house, the Zoo's Ghost Train and more! Tickets are limited: learn more about the event and how to get your tickets today! Boo at the Zoo - LIMITED TICKETS REMAINING FOR EVENT BUY NOW! Now Boo At The Zoo will be FOUR days with admission at 5pm each day! Ticket prices are $16 per person (adult or child) and can be purchased at AudubonInstitute.org. Handling fees apply. Bring your little ghosts and goblins to Audubon Zoo this year for Boo at the Zoo! This annual Zoo extravaganza is a safe, fun-filled Halloween event for children up to age 12, featuring trick-or-treat houses with candy, the Mombassa Ghost Train, a haunted house, games with prizes and entertainment. All games and treats, except concessions, are free with admission. A limited number of tickets will be sold for each night, giving visitors the opportunity to experience Boo at the Zoo in a more relaxed atmosphere. Tickets are $16 per person for 5pm-9:30pm admission, $13 per person for 7pm-9:30pm, and may be purchased online at AudubonInstitute.org. Handling fees apply. Children under 1 year of age are admitted free. A limited number of tickets will be sold for each night, giving visitors the opportunity to experience Boo At The Zoo in a more relaxed atmosphere. $1.00 per ticket fee plus a 2.5% handling fee for online ticket sales. at the Zoo Entrance and Children's hospital during regular Zoo/hospital office hours. Cash, charge, check accepted. Please make all checks payable to BOO AT THE ZOO. Children under the age of one year are free. No member discount. No limit on number of tickets purchased. Adults must purchase tickets as well as all children 12 months or older Children under 12 months of age are admitted free. Adult and children tickets are the same price. Each person entering the event needs a ticket. Event is held rain or shine. Tickets will be honored ONLY for the date purchased. PLEASE NOTE: MOMBASSA GHOST TRAIN RIDE CLOSES AT OR AROUND 8PM! Train ride can be scary for children under 8 years of age. 6 pm Dennis & Co.
Tickets are non-refundable, non-transferable, and non-replaceable. No rain dates. 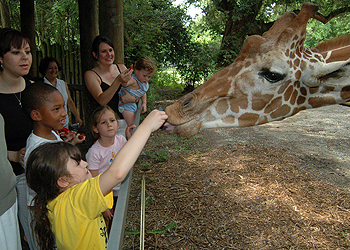 Audubon Zoo is located at 6500 Magazine Street in New Orleans. No coolers, ice-chests or outside food or beverage allowed inside the Zoo during this event.